Trinamool Congress Himachal unit, in a press conference announced to fight on 40 assembly segments in the forthcoming assembly election. State party convener Dr. Pramod Sharma stated that party will announce the name of candidates by 30th Sept.
Dr. Pramod Sharma alleged that both Congress and BJP have failed to deliver good governance and lack of farsightedness has resulted uneven development of the state. He said that thousands of educated youth are unemployed and because of faulty policies, these youth are forced to look for the jobs in other states. He stated that if voted to power TMC will promote tourism activities in state. 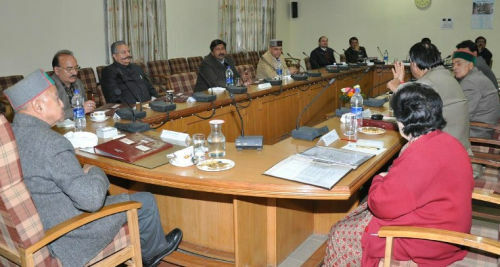 He said that Himachal Pradesh has potential to promote state tourism on international level. He added that Himachal Pradesh has immense potential of Horticulture and agriculture based industries and that can also generate meaningful employment in the state. He condemns the decision of total ban on tree falling and claimed that because of it state is losing huge revenue. He said that systematic and scientific falling can be good for the state and its forest as well. Giving an example of the western countries, Sharma said that European countries are gaining from their forest wealth and earning good from it as well. He advocated the forest plantation and added that it can be a multi billion business in Himachal Pradesh. In the press conference, Dr. Pramod Sharma also released TMC’s 20 point programme, in which party tries to include every section of the society. Sharma also announced his candidature from Theog assembly segment. He admitted that TMC is not in a position to make a big impact in Himachal Pradesh, but claim to be a king maker. He also refused any pre-poll alliance with any political group. He said that TMC is doing a membership campaign and before assembly poll it will registered above two lakh members in hill state. He added that senior party leader KD Singh will address a rally on Theog on 29th September.